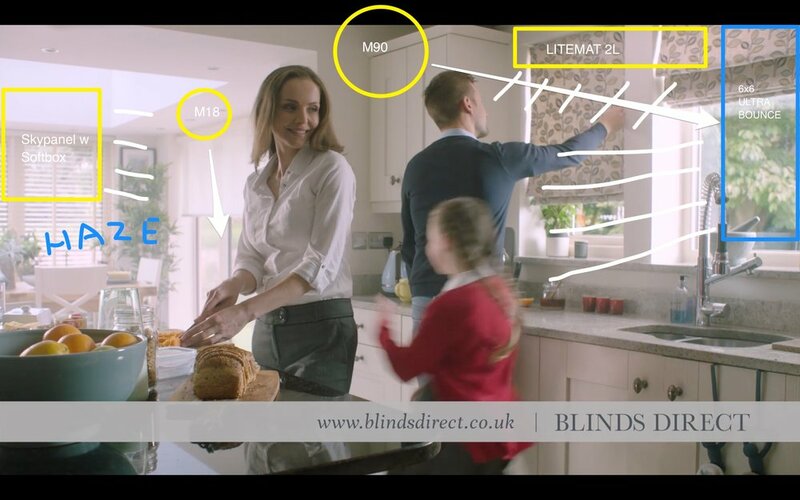 I was asked by Stada Media to DP a TV commercial for Blinds Direct. First thoughts were that it would be relatively a straightforward thing to light. I've done a fair amount of work where I have to simulate natural lighting with a commercial look. However, I soon realised that this would be a bit tricky, as we were pointing straight into windows in almost every shot. I'm not a fan of High-Key lighting. 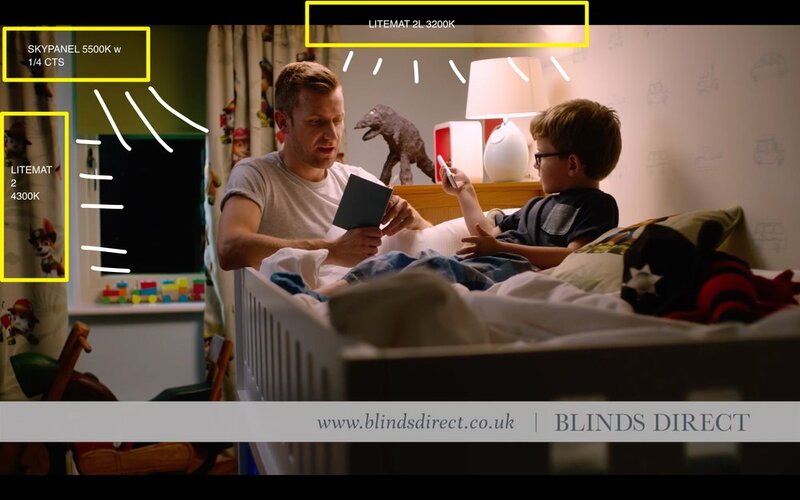 It's used a lot in certain types of commercial, and I find it usually produces a very flat, somewhat cheap look. It seems a throwback to crappy video cameras with low dynamic range, but has clung on as a commercial style. 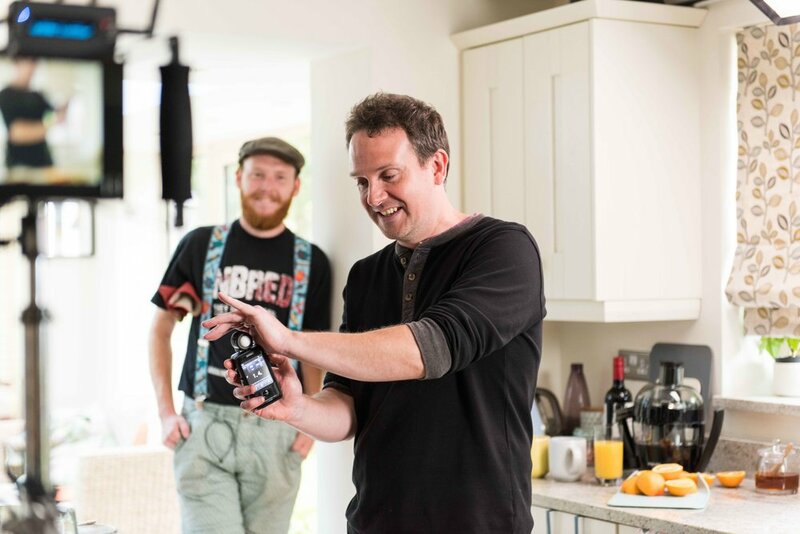 Thankfully director Danny Lacey was in agreement with me and wanted to keep it looking natural. Of course I was aware that it still had to have that commercial cleanness- and we needed to see the actual product! We shot on the Arri Amira with Zeiss Superspeeds M2's. I really like lighting a kitchen - honest! You can get a really nice clean look, but you have to be careful of all that light bouncing around. Very easy for it to all just flatten out. The tricky thing with this shot was lighting 4 actors, trying to keep the light 'downside' and allowing for the blind being opened. 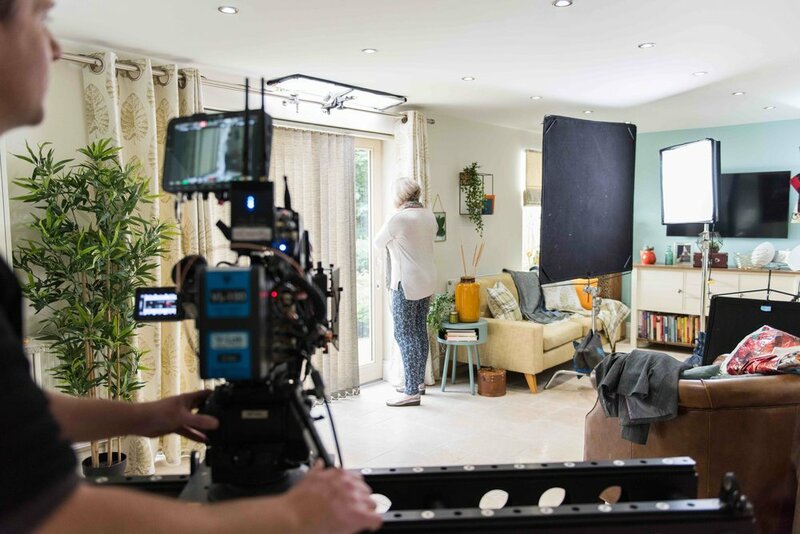 To keep the outside M90 well and truly hidden, we hit it across the window and bounced it into a 6x6 ultrabounce. This did a nice broad stroke and brought the levels up on the sink area and Mum. 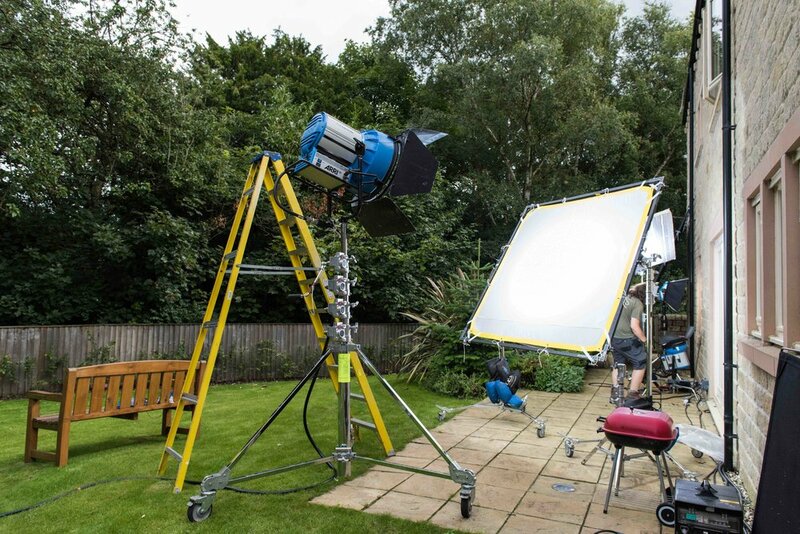 Dad's face was too dark as the light was being blocked by the blind and central column, so my gaffer Finn rigged a Litemat 2L across the top with a C Stand. 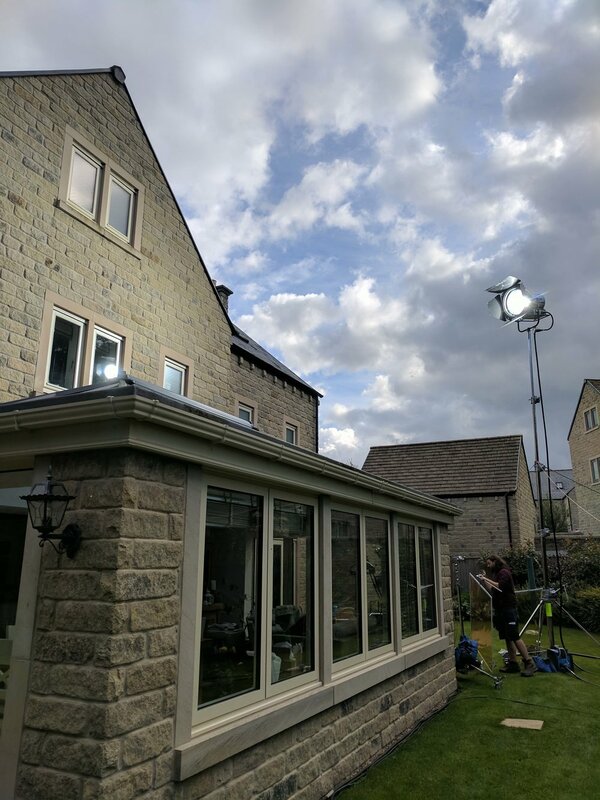 Then we had a Skypanel with softbox and eggcrate as a backlight/key when Mum turns, and finished it off by hitting an M18 into the Orangery through some light haze. This one ended up being quite tricky. The room was very dark, as it was overcast. We had to light the 'Nana' and the kids outside, without getting reflections. This is close to what we did with the M90 and M18, but we pulled the M90 back behind the kids so as not to sandwich them with light. This also came direct through the window and keyed the Nana. Another tricky one, as we needed to make it look like night time, in the day time. I decided to tent it. In hindsight, would I like to go back and perhaps try heavy ND and colour correction on the windows, so that we can see some detail outside? Yes. Was it possible to try both methods on the day? No. So I went with tenting as a 'safe' option that I knew would work. I wanted golden rays beaming in through the blinds, and ironically that's exactly what we had when we came to shoot this scene. The sun was PERFECT. But heart-breakingly, it only stayed that way for 20 minutes. So by the time we were ready to turn over it was just smashing straight down the lens. So we found ourselves waiting on the sun to go behind the trees! This was a morning shot, done in the early evening. The sun was now on the opposite side of the house and smashing into the trees outside. The room was in complete shadow. We had to really play with the angle of the M90 through 6x6 grid to get it into the room and onto dad. We also did a soft rim light with a LiteMat 2. Mum was still in complete shadow, and my plan was to bring the M18 in hard. But on the day, it was going to be a real challenge to get that angle working, plus I was mindful of it then just smashing into dad. So in the end, we boomed over the LiteMat 2L, which I warmed up a tad. It's worth mentioning at this point just how incredibly useful these ultra lightweight LED mats are. In the past, this would have been something like a Diva, and there's no way I could have double armed it over like we did here! Last scene of a very long day and thankfully it was an easy one. The office was tiny, so we pretty much had one choice of angle. We hit the M90 through the 6x6, which made it very film noir :) So to bring up Dad's level, we put a Litemat 2 directly behind him, then bounced that off a polly board in front. Overall, I'm very happy with what we got done in one day with a small crew. As always, there's things I'd like to go back and do a bit differently, but if there wasn't, I'd be worried! Client was very happy and that's about the best you can hope for really! Hopefully this post has been useful to you if you are approaching a similar shoot.